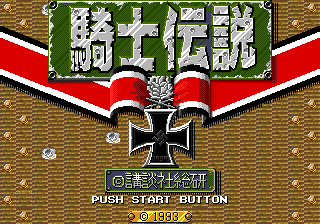 Kishi Densetsu (騎士伝説) is a 1993 real time war simulation/strategy game for the Sega Mega Drive by Kodansha Research Institute released exclusively in Japan. Players will assume the role of an Unterstrumführer (equilavent of a second lieutenant) and take command of a Waffen-SS tank platoon. Starting from invasion of Poland, players will command up to 16 tanks in various battlefields in real time and attempt to destory enemy vehicles. As the players complete levels, both player character and other tank commanders will be promoted to new ranks, gain medals and improve their abilities. New tanks and replacement commanders will also appear after every level. Since death of commanders in permament and amount of replacements are limited, player is encouraged to take good care of their tanks. Gameplay takes place during real time. Obstacles in the field, such as trees, building or rock formations can lower accuracy and block shots while terrain can improve vehicles' speed or protection. All vehicles in the game have stronger armor in the front, weaker in the sides and weakest in the back, which means flanking enemies and protecting your own flanks will be crucial. In 1999, Gaijin Productions released a partial translation patch which translated most of the menu options making the game at least playable. Name was translated to "Panzer Commander". Main article: Kishi Densetsu/Magazine articles.